Heather Hancock is a Chicago artist exploring urban light and perspective. Heather’s work embraces the materials of modern architecture—glass and concrete—to capture the energy of the urban environment. Her work hangs in private residences, and corporate, healthcare and government collections across the United States. 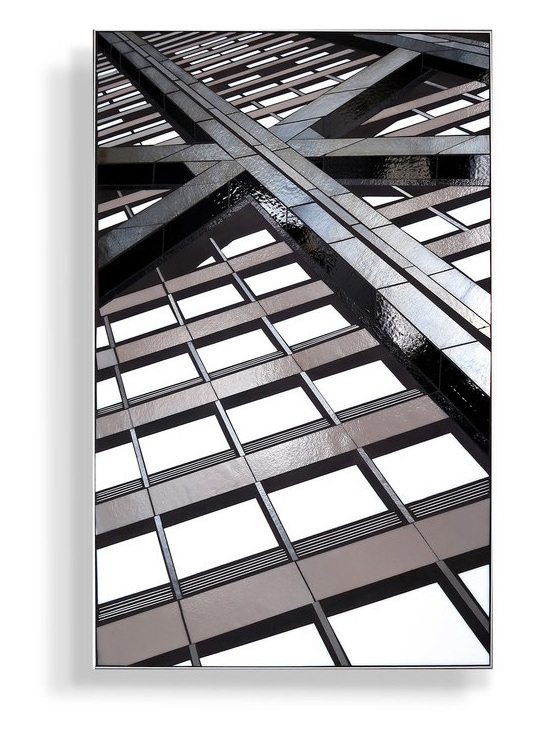 Architectural abstractions capture the play of light and energetic perspective of the modern city. Abstracted text and organic forms entice with color and content of the urban streetscape. 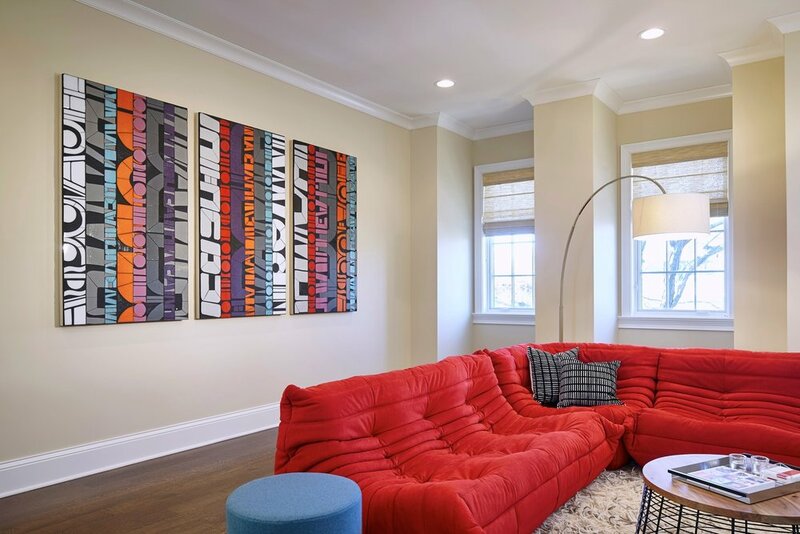 Heather frequently collaborates with art professionals on commercial and residential projects. Commissions have ranged in size from 24” x 24” to multi-panel wall-filling compositions. Nope! It’s hand-cut glass set in grout. 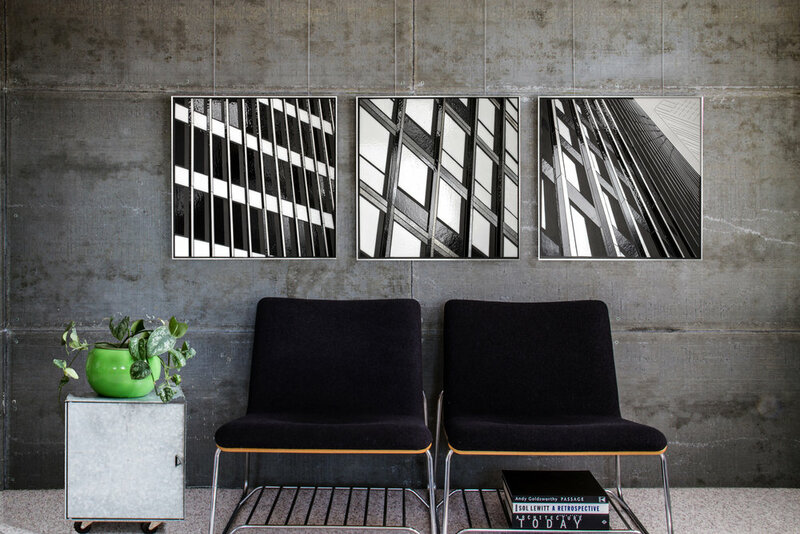 Heather abstracts architectural forms and renders them in glass, capturing the energy of street-level perspectives and the play of light and shadow on the architectural materials. The end result is a dynamic, visually responsive effect that’s hard to capture in photos. Are these pieces heavy or hard to hang? The work is engineered to be surprisingly light and very easy to hang. The glass and grout are adhered on foam core and secured on custom wooden frames. Each piece ships with a standard metal z-cleat. At approximately 3 lbs / sq ft, even large pieces weigh only a fraction of the load capacity of the cleats. Back view of z-cleat and frame. Does the work require special lighting? Glass loves light. The opaque, clear, mirrored and iridescent glasses in these pieces respond to natural and ambient light in your space. Natural irregularities in the glass play with the light as it changes in your space throughout the day. Custom lighting can enhance this effect and Heather has some simple tips to share from a lighting engineer. Just ask. All artwork and content copyright © 2019 Heather Hancock Studio. All rights reserved.